4.2 out of 5 based on 79 bloggers and 8 commenters. 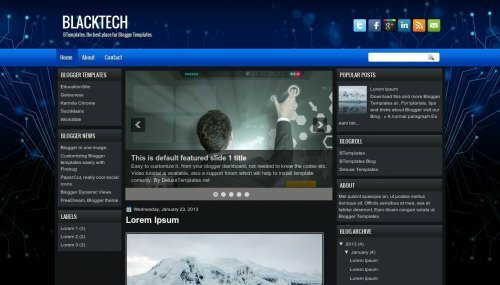 BlackTech is a free blogger template with 3 columns, left and right sidebars, slider and social bookmarking icons. tinggal download aja, itu kan ada bacaan download.. This tamplate is great. But i want to know that 2 coloumn or 3 coloumn template, which is good for getting visitor. I mean which template like most of visitor. How to change Header Background and change the size? kenapa di blog saya jadi gini ya..? Tidak dapat memuat pratinjau template: Kesalahan saat mengurai XML, baris 119, kolom 3: The element type “div” must be terminated by the matching end-tag “”.